211 is an easy to remember (2-1-1) information and referral service available 7 days a week, from 8 am to 6 pm, 365 days a year, which will eventually be open 24 hours a day. 211 Community resources directory is also available on the web. In collaboration with community organizations, all information on social and community resources is updated annually. With the help of statistics from calls and web frequency, 211 sheds a light to government officials and decision-makers on social needs and in determining missing resources that are needed. 211 Greater Montreal territory includes most of the Communauté métropolitaine de Montréal (CMM), as well as the non-CMM cities of the MRC de l'Assomption, the MRC Vaudreuil-Soulanges and the MRC Les Jardins-de-Napierville. The CMM includes 82 municipalities grouped into five major geographical sectors: the island of Montreal, the agglomeration of Longueuil, Laval, the North Shore and the South Shore. In total, 4 million people live on the territory of the CMM, which represents nearly half of the population of Quebec. See the map of the CMM. 211 is implemented in Québec since 2008 in the Capitale-Nationale and the Chaudière-Appalache regions, and since 2012 in the MRC Haute-Yamaska. These regions are served by the Centre d'information et de référence de la Capitale Nationale et de Chaudière-Appalaches. In the Greater Montréal, 211 was launched in Laval in October 2016, in the MRC de l'Assomption in April 2017 and in the MRC Thérèse-De Blainville in October 2017. Since December 2016, the 211 web service is available for Montréal. 211 is now available since April 1st 2018 in all the Metropolitan Community of Montréal area and the MRC Vaudreuil-Soulanges. Since November 1st 2018, the service is also available to MRC Les Jardins-de-Napierville citizens. The 211 licence was reserved by the CRTC for Canadian information and referral centres in 2001. InformCanada, that regroups the Canadian information and referral centres, and United Way/ Centraide Canada received from the CRTC the authorization to reserve a 211 phone number for the Canadian information and referral centres. 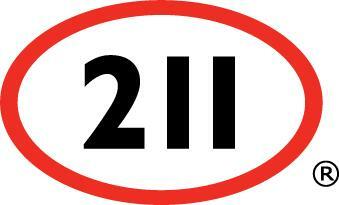 211 is already implanted in 7 Canadian provinces: British Columbia, Alberta, Saskatchewan, Manitoba, Ontario, Québec and Nova Scotia. Pilot projects are also in progress in New Brunswick and Nunavut. Finally, 211 is in operation in the United States since 1996 and today more than 246 million Americans (90% of the population), in 50 states, have access to its service.